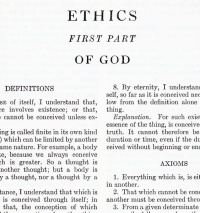 Ethics seeks to resolve questions dealing with human morality—concepts such as good and evil, right and wrong, virtue and vice, justice and crime. Antihumanists such as Louis Althusser and Michel Foucault and structuralists such as Roland Barthes challenged the possibilities of individual agency and the coherence of the notion of the 'individual' itself. As critical theory developed in the later 20th century, post-structuralism sought to problematize human relationships to knowledge and 'objective' reality. Jacques Derrida argued that access to meaning and the 'real' was always deferred, and sought to demonstrate via recourse to the linguistic realm that "there is nothing outside context" ("il n'y a pas de hors-texte" is often mistranslated as "there is nothing outside the text"); at the same time, Jean Baudrillard theorised that signs and symbols or simulacra mask reality (and eventually the absence of reality itself), particularly in the consumer world. Post-structuralism and postmodernism argue that ethics must study the complex and relational conditions of actions. A simple alignment of ideas of right and particular acts is not possible. There will always be an ethical remainder that cannot be taken into account or often even recognized. Such theorists find narrative (or, following Nietzsche and Foucault, genealogy) to be a helpful tool for understanding ethics because narrative is always about particular lived experiences in all their complexity rather than the assignment of an idea or norm to separate and individuated actions. In present day terms the powerless may include the unborn, the terminally sick, the aged, the insane, and non-human animals. It is in these areas that ethical action in Hoy's sense will apply. Until legislation or the state apparatus enforces a moral order that addresses the causes of resistance these issues will remain in the ethical realm. For example, should animal experimentation become illegal in a society, it will no longer be an ethical issue on Hoy's definition. Likewise one hundred and fifty years ago, not having a black slave in America would have been an ethical choice. This later issue has been absorbed into the fabric of an enforceable social order and is therefore no longer an ethical issue in Hoy's sense. Unless indicated otherwise, the text in this article is either based on Wikipedia article "Ethics" or another language Wikipedia page thereof used under the terms of the GNU Free Documentation License; or on original research by Jahsonic and friends. See Art and Popular Culture's copyright notice. This page was last modified 11:55, 26 December 2014.